“When my wife and I were newlyweds we adopted a rescued puppy—a tiny white ball of fluff that eventually grew to be a very smart, loyal Australian Shepherd. While he was still young, though, he contracted parvo and had to spend a week at the vet clinic. We almost lost him and were thrilled when he pulled through. Does this Pets Best Insurance employee’s story sound familiar? At Pets Best, we are about more than dog insurance, we are dog lovers and owners, and we know how awful it can be to deal with a dog who hates to go to the vet. So we’ve assembled the following list of advice on the subject from a variety of dog owners and behavior experts. Have any further advice on this topic? Feel free to post it in the comments section below. 1) Try changing your own attitude. Because dogs are sympathetic to human emotions, your dog may be picking up on your own nervousness, so stay calm and happy. 2) Reassure your dog that everything’s alright, but don’t do it too much; if you’re saying “It’s okay, sweetie, it’s okay,” over and over, your pet may think there’s reason to be scared. 3) Protective pet? You might try staying in the waiting room during your dog’s exam. Could be your dog is acting tough because he’s trying to protect you. 4) Heard the expression “travel broadens the mind?” If your dog is used to going places and socializing with people and other animals, the vet’s office won’t seem so scary. 5) Start going to the veterinarian’s office just to say “hi.” Your dog will learn it’s not a bad place after all. 6) Whenever you go, keep a bunch of treats in your pocket and reward the dog frequently. Eventually, the dog will associate the veterinarian’s office with food. 7) Small dog? Make sure they feel comfortable, safe and secure by bringing them in their dog crate. 8) Bigger dog? Use a shorter lead when you go to the vet—you’ll have better control and will be able to keep the dog close to you. 9) If your dog growls and snaps at people when scared, consider a comfortable muzzle. Make sure the dog gets used to wearing it at home first, though. 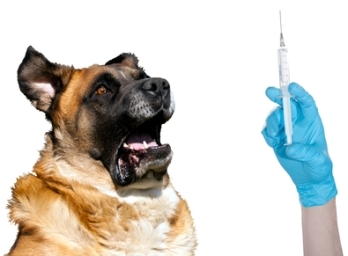 10) If nothing else is working, you may want to ask your vet about prescribing a sedative the dog can take before a visit to the vet. This may reduce the wear and tear that extreme stress can have on the dog’s body.